CINCINNATI -- Cincinnati ranks in the top 30 "greenest" cities in the U.S., according to an October report from the personal finance website Wallet Hub. Just a few months before that, Site Selection magazine ranked the city as the country's "most sustainable." It's certainly good news to Ryan Mooney-Bullock, whose team at Madisonville-based Green Umbrella Thursday will commemorate two decades of working to preserve the region's plentiful landscape of green spaces like parks, preserves, and gardens. "One of the things we’re really proud of with our city is how you can get to natural areas no matter where you live," Mooney-Bullock said. According to her data, 83 percent of Hamilton County residents live 10 minutes or less from a protected green space, and that's on foot. Within Cincinnati city limits, that figure jumps to 91 percent. Across Greater Cincinnati, Green Umbrella counts 115,000 acres of protected green space. But the nonprofit's scope expands beyond keeping beautiful places beautiful. Despite the notable position on the "greenest cities" list, the Tri-State's stretch of the Ohio River Valley and the surrounding hills face a wide-range of environmental challenges, Mooney-Bullock said. She worries, for instance, about the high number of Tri-State folks -- including 36,000 kids in Hamilton County alone -- living with asthma and the American Lung Association's ranking the region 18th worst in the country for year-round particle pollution . 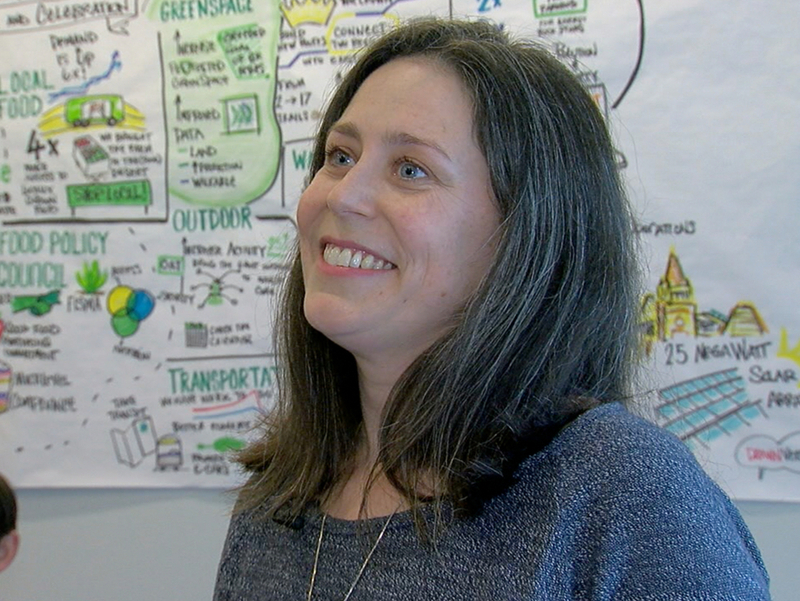 "In my mind, we have a big disconnect when we have huge asthma incidents in our region, and we also have an amazing green space," she said. Over two decades, the group's focus grew from protecting green space to encompass a range of issues that fall under the umbrella -- getting the name now? -- "sustainability." Green Umbrella began humbly in 1998 as the "Regional Green Space Initiative." It was "literally a dozen folks sitting in a small office or a conference room in a library," as Mooney-Bullock describes it. By the time she began volunteering with Green Umbrella in 2011, the group had already started widening its field of vision. She came on board to manage the Green Learning Station at the Civic Garden Center of Greater Cincinnati in Avondale, where she educated people on stormwater management and environmentally efficient gardening methods. Just a few years later, Green Umbrella would become one of the groups behind launching Red Bike -- the region's nonprofit bike share program with rentable bikes and docking stations in neighborhoods on both sides of the river. 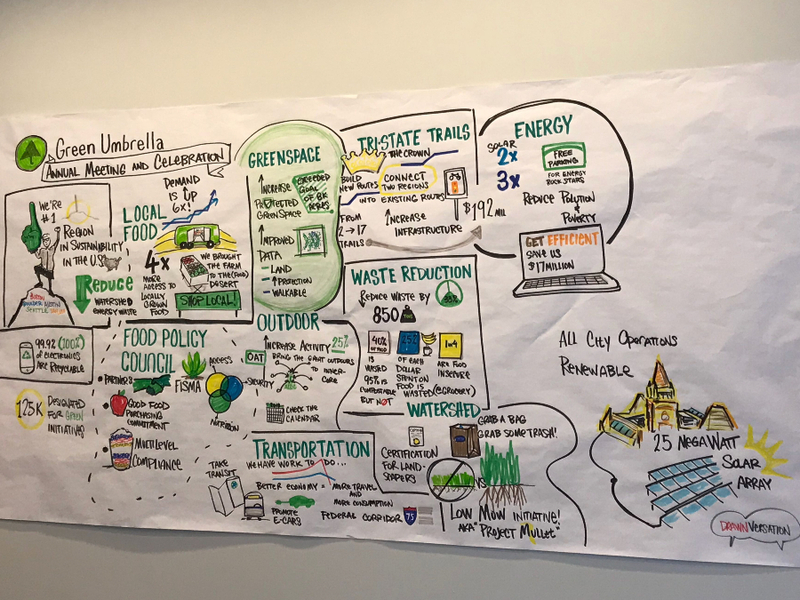 By 2018, Green Umbrella grew into an organization with more than 900 members and seven focus areas: energy, green space, local food, outdoor, transportation, waste reduction and watershed. Some programs even have full-time staff, such as Tri-State Trails or the Greater Cincinnati Regional Food Policy Council. Members consist of individuals as well as nearly 200 groups and organizations. The city of Cincinnati, the Cincinnati Museum Center, Interact for Health, Fifth Third Bank, and dozens of others have adopted Green Umbrella's resolve to get the region's "green city" rank from top 30 to top 10 by 2020. Site Selection magazine has already dubbed the city as "Most Sustainable" metro area in the country in a report this summer. Most recently, Green Umbrella scored a big win when the city of Cincinnati in October received a $2.5 million grant from Bloomberg Phlanthropies' American Cities Climate Challenge. The city's Office of Environment and Sustainability will be able to use that money toward its commitment to making Cincinnati an officially designated "2030 district." 2030 districts consist of property owners and managers who pledge to reduce their buildings’ energy and water consumption and transportation emissions by half by the year 2030. Kroger recently announced it will join the growing list of regional groups joining the new Cincinnati 2030 district . "We've come a long way," Mooney-Bullock said. "It’s not just about, ‘Can I get out and hike a trail this weekend?’ but, ‘Can I get where I need to go in order to make a living or in order to pursue an education, and can I do so in a way that is not going to create a huge amount of pollution?'" With so many member organizations, Green Umbrella's role is to foster connections, Mooney-Bullock said. "We're a small, lean backbone organization who can coordinate collaboration amongst a bunch of different people," she said. "From governments to businesses to educational institutions to nonprofits, concerned citizens — they’re all at the table trying to figure out how to move that problem forward quickly." Green Umbrella will commemorate 20 years with a celebration Thursday evening at The Sanctuary event center on St. Michael Street in Lower Price Hill. Tickets for non-members cost a $35 donation. More information is available here .